The situation of refugees in Greece and on its islands is reaching a critical point, with a dangerous deterioration in all aspects of life, warns the Euro-Mediterranean Human Rights Monitor. According to the latest statistics, Greece currently hosts 16,209 asylum-seekers on its islands and another 33,650 refugees on the mainland, more than half of whom are children and women. The camps in which they are confined typically are located in broken-down factories or hangars where people often are relegated to tents, lacking all but the most basic aspects of living, says Euro-Med Monitor. During five months of field observations and interviews, a Euro-Med Monitor team witnessed the absence of heaters, running water, medical care and security protection. With the arrival of winter, residents are at risk of hypothermia and a serious deterioration in their health is feared, particularly among children and pregnant women. On December 2, the Euro-Med team witnessed the relocation of 1,500 refugees, mostly children, after their camp (at Mount Olympus) was deluged with snow. Unfortunately, such relocations usually come too late, with most people still suffering in tents without electricity or heating devices. In addition, the Euro-Med Monitor is deeply concerned with the lack of access to legal services and security protection for refugees and migrants in the camps. The mistrust between the residents and the protection officers leads to reluctance to report crimes and other illegal acts that take place in the camps. “There are rapes, drugs, hashish and gangs in the camp… Anyone can enter easily; there are no rules,” an asylum seeker from the Softex camp told the Euro-Med Monitor. Women living in Athens settlements and the Vasilika, Softex and Diavata camps reported feeling perpetually at risk as they try to protect their children from sexual abuse, trafficking and drug use. Asylum seekers also are subject to regular xenophobic attacks and fascist violence, including attacks with Molotov cocktails and rocks. Volunteers who work with them are terrorized, often subjected to forced strip searches and detention at the hands of native residents and police. Journalists are threatened if they document the attacks. The Euro-Med Monitor team also was subjected to such threats while witnessing several attacks on asylum seekers in the Chios camp. A full report now being prepared by Euro-Med Monitor documents refugees being forced to wait for extended periods of time before their cases are processed. “The system is slow and frustrating; asylum seekers are forced to wait in these bad conditions, for up to eight months before they are even initially interviewed,” reports Henriette Johansson, Euro-Med Monitor’s refugee researcher and representative in Greece. Every day, cases of asylum seekers committing suicide, burning property and protesting are documented. For instance, a protest against the inhumane, overcrowded conditions was broken up in Moria camp in September. “Despite pledges from the Greek Asylum Service to ensure all refugees and migrants equal access to the asylum process in their respective languages, the facts on the ground show otherwise. The line for a particular language is open only one hour per week, leaving people desperately waiting.” says Ihsan Adel, Euro-Med Monitor’s refugees adviser. The EU-Turkey deal also is to blame for the unrest, resulting in more than 16,000 people being trapped while waiting for deportation on the Greek islands of Lesvos, Chios, Samos, Leros and Kos. The number of residents now is double the capacity of the five islands combined. Euro-Med calls on Greek authorities to comply with the provisions of the 1951 Refugee Convention, the European Asylum Procedures Directive, the European Qualification Directive and Reception Conditions Directive. These regulations mandate Greece to improve the standards of living in the camps and encourage police and other authorities to be of support to refugees as much as possible. 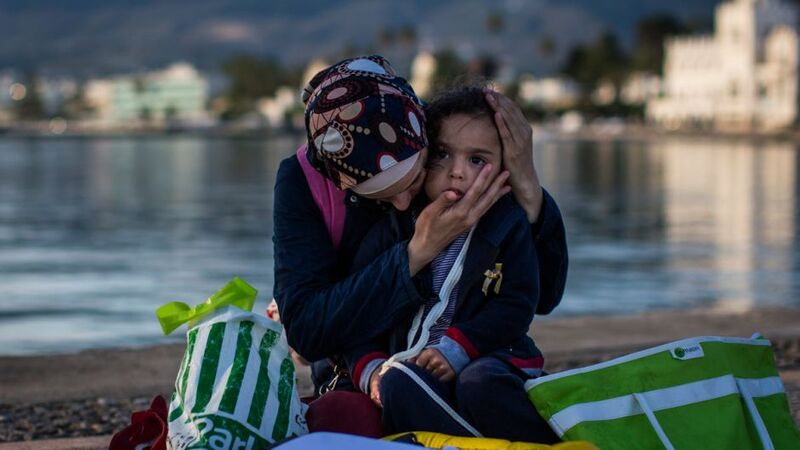 Finally, Euro-Med Monitor calls on EU countries to share the burden of the refugees with Greece, which already has a fragile economy and poor capabilities. The EU must accelerate the pledged relocation process and re-examine the usefulness of the EU-Turkey deal from a humanitarian prospective rather than only a political one.